Despite suffering from a heavy cold for the past few days, Stuart Bingham scored a 10-7 victory over Robbie Williams to reach the second round of the Betfred World Championship. Basildon’s Bingham lost to Ken Doherty in the opening round at the Crucible a year ago, but this time there was to be no denying him a last 16 spot as he battled through to set up an encounter with Graeme Dott. It has been a fine season for world number ten Bingham so far as he has lifted trophies at the Shanghai Masters, Haining Open and Championship League. Mark Selby and Shaun Murphy are the only other players to have won three titles. The Essex cueman has never been beyond the quarter-finals at Sheffield but hopes this could be his year. 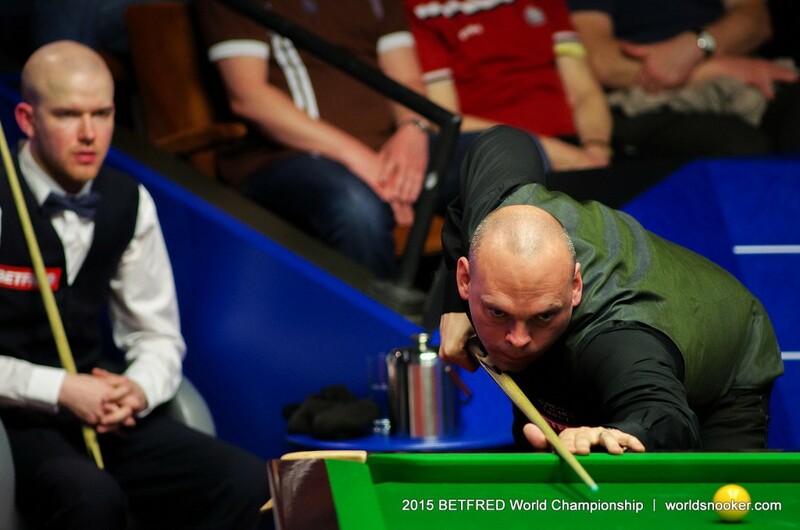 “It has been a lifetime dream of mine to play in the one-table set-up here,” said Bingham. “I’ll just keep trying. Last year I was so disappointed to lose in the first round so I’m really pleased to win today. Wirral potter Williams, who lost to Neil Robertson on his Crucible debut last year, led 5-4 after this morning’s first session. Bingham took the first frame tonight with a break of 69, then added the next with a 43 clearance, before a run of 87 from Williams made it 6-6. Bingham then pulled away, winning three frames in a row with a top break of 51. Williams got the better of a safety battle on the green in the next and cleared to close to 9-7. But Bingham won a scrappy 17th frame to secure his progress. Ali Carter received a warm reception from the Crucible crowd, having battled cancer since his last appearance in Sheffield, and he built a 6-3 lead over Alan McManus. Two-time finalist Carter started superbly with a break of 127, and later pulled away from 2-2 to 5-2 with runs of 51, 63 and 53. McManus pulled one back but Carter took the last of the session with a 63 to give himself a comfortable lead ahead of the conclusion tomorrow afternoon.